I recently returned from an amazing adventure in beautiful Costa Rica! “Pura Vida” seems to be the country’s slogan. You see the phrase printed on just about every souvenir and hear it exclaimed regularly. In English it means “pure life” and roughly translates to mean cool, great, awesome, etc. Pretty much everything in Costa Rica would fall under this definition. Imagine this: You just spent the morning hiking down a non-descript jungle path that led to a hidden beach. You wouldn’t have known about this beautiful location if not for the tip from the local surf instructor. 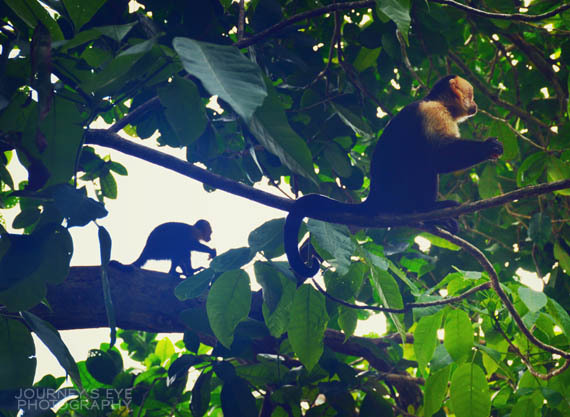 Once there, you lay under the trees on the sand while watching monkeys jump from limb to limb above you. After spending some time in the warm ocean waters, you find yourself back in town and in an open-air café enjoying a drink made from some of the best fruit you’ve ever tasted. The scene you look upon is of the jungle hills and the ocean sprawling across the horizon. As the jungle rain starts to fall outside, a toucan flies by. You sit back and order your second drink. This, my friends, is Pura Vida. This is Costa Rica. Stay tuned to the Etsy Print Shop for prints from Costa Rica to be added soon! Contact me if you would like to purchase a print of any image you see here. Wishing you Pura Vida!